DEATH VALLEY, Calif.  Nothing stays cool in Death Valley during the summer, where the temperatures in the summer can soar up to 130 degrees. It’s 8 p.m. on Tuesday evening at the start of the Nutrimatix Badwater-135, where in any other place the temperatures would be dropping, but in Death Valley the temperature is still 114 degrees. The race is in its 38th year and according to organizer of the race and President of AdventureCORPS Chris Kostman, each year the race comes with its own drama. At the Badwater-135, the drama starts with the star of the race, the heat. At this particular foot race the athletes love the heat. For these runners, to run in the hottest place on Earth is a badge of honor – the hotter the better. For the park rangers who live there, the summer has not been as hot as usual. “This summer has been mild in the Valley with the hottest temperatures around 120 degrees in June,” said Park Ranger Amanda Updegraff. She said the high for the runners would be around 116 as they exit the park on Wednesday afternoon, about 40 miles west of Stovepipe Wells. Adding to the drama this year was a new start time. The 8 p.m. start was the first night start of the race since the eighties, when the race started in the evening from 1989 to 1998. Kostman said the only problem for the runners starting at night is being up all day expending energy before the race. Along with the drama comes the setting. There was the fact that the race returned to its original course. This was the first race at Badwater after a year hiatus. Last year the race was outside the park due to a park-wide safety stand-down. 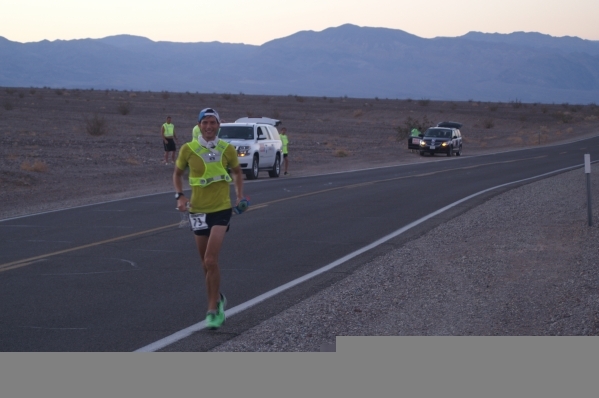 Kostman said it was nice to return to the original course of the Badwater-135. Finally, you can’t have intense drama without the main characters – the runners. 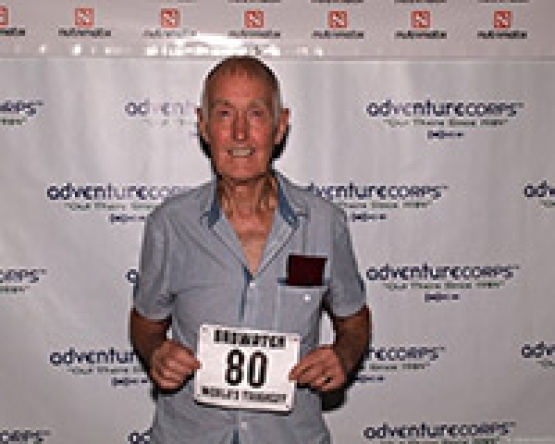 Jack Denness at 80 years old is from Great Britain and was running the race for the last time. After 15 years of running, Denness is calling it quits after this year. He has the record as the oldest person to run the race and finish, at 75 years old he completed the course in 59 hours. This year he brought his son Steve and his grandson Matthew. Steve Denness is the crew chief for his father and he said His father’s goal was to finish at least 100 miles of the race. “He has had some health problems earlier in the year with his lungs, but that seems to have all cleared up,” he said. The son said his father started racing when he was 19 and he is 52 now. Steve Denness said his father found out about the Badwater race about 1988 from a friend while at the New York Marathon. The son said it’s hard to train for the heat in a country that has none. He said his father would work out in steam baths and do long walks. He said a typical walk for his father could be 24 miles. The crew chief said Jack was affected by the new start time. “Normally at 8 p.m. my dad would be sleeping because he goes to bed early and so he has less energy,” Steve said. About 10 miles east of Stovepipe Wells at 5:30 a.m., the PVT caught up with Jack to see how he was doing. His pace was slow and he was in dead last, but he looked steady and was not out of breath for he spoke with ease. As of Thursday morning, he had not finished the race. Then there is Oswaldo Lopez at 43 years old, who is making a comeback this year after failing to complete the race in 2014. 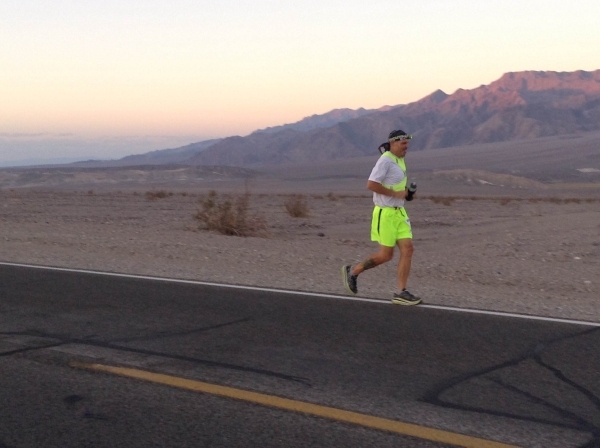 Lopez is a runner from Madera, California and is in his ninth Badwater race. He hopes to beat Harvey Lewis this year, who won it all last year. Lopez trained long and hard and wants to erase last year’s bad memory. Lopez lives near Fresno, California and said this is ideal for him because Fresno has enough heat to train in. But the heat is not the heart of his training. Every weekend, one will find Lopez up in the Sierra Nevada mountains training at high altitude, in Yosemite or Sequoia National Park. “I will train every weekend running four to five hours at distances of 30 to 40 miles,” he said. In 2011, Lopez finished in first with a 23:41 time and he was 39 years old. Lopez said he will try to stay with the pack in the valley. He wants to hit Stovepipe Wells in about six hours. “When I get to the mountains, then I will open it up,” he said. Lopez said the new start time didn’t matter to him. “I am just excited to run the race,” he said. Another story is Amy Costa at 50 years old, who said she still has enough in her to compete with female front-runner Pam Reed, who finished ninth last year overall and won Badwater in 2002. Costa is from Jacksonville, Florida. In the 2014 race, Costa was the fourth woman to finish and she finished 13th overall with a 26:48 time. She could very well be the woman to win it all this year. Costa is running this year for her charity, Crohn’s & Colitis Foundation of America. Costa likes to run at Badwater because her fellow runners treat her like family. Costa said she knows about trouble because she has been there herself. She said Sentinella caught the problem early. Too much water during this type of race can bring on water intoxication, which can kill you. Costa said she started running after college and she did her first ultramarathon in 2000. Sentinella said he likes the way Costa runs now. Costa said she is motivated to run by her charities that she runs for. “I like to focus on my running in hopes of motivating others to succeed,” she said. Of course the race is all about the drama of the guy that just goes out to complete the race. Tony Portera from White Plains, New York at 44 years old is this guy. Last year he finished 42nd (33:12). This will be his seventh Badwater. For him it has been a lot of trial and error on how much to drink and what to eat. He said he started doing ultras to get in shape. He said his biggest fear has nothing to do with the big rattlesnakes found in Death Valley, but with the fear of failing.